Planetary meteorites! These were the objects of the lofty goal set by my brother, Adam, and I during the summer of 2001. We have always been goal-oriented individuals, with a huge amount of energy and even more determination. The experience we had in meteorite hunting consisted mainly of being “arm-chair” treasure hunters, financing other individuals’ expeditions to Morocco. One of these trips produced the now-famous lunar meteorite, NWA 482 ( see www.LunarRock.com ). On yet another one of these investment opportunities, I was able to join the team and gained valuable insight into some of the methods required to work with the Moroccans. After several investment trips, we decided it was time to venture out on our own. Adam and I put together a plan that would require finding a partner in Morocco. He would be our “point man” who would find the potential meteorites we sought and ship them to us. The first task was finding an honest dealer in Morocco. Using the Internet and good old-fashioned telephone, we soon established our first partnership. This proved to be a challenging ordeal that only lasted four months. After spending a substantial amount of money and suffering through many sleepless nights, we ended this arrangement. It quickly became apparent this “partner” was a con artist and a very good one! Determined more than ever to succeed, we didn’t let this situation deter us. Before we could establish a new partnership in Morocco, we attended the Tucson Gem and Mineral show in February 2002. Here Adam and I finalized the purchase of a unique orthopyroxene-bearing Nakhlite. This Martian meteorite was rumored to exist in Morocco as early as September 2001. The dealers from whom we purchased this stone took the rumor seriously and played a key role in its acquisition. We were invited into the pursuit of this mysterious stone because of its extremely high asking price, although we held little hope that it actually existed. Once the rumor was proved true, the deal was struck. This Nakhlite was given the provisional name NWA 998. Akmed what to look for by describing the characteristics of existing Martian and lunar meteorites in great detail. We also went as far as insisting that we receive the potential meteorites before making any payments. Within the first three packages, we had received everything from Howardites, Eucrites, LL’s and even CR’s. Excitement was starting to build. Later, a package arrived that held a 50-gram stone with no fusion crust, which caught Adam’s attention. After weighing the stone, Adam cut it and was delighted by the weathering ring and texture he saw on the inside. He said, “I’ll give this an 80 percent chance of being a Shergottite”. The next day a thin section was prepared at the University of Washington and revealed the characteristic presence of maskelynite, determining it was a Shergottite. NWA 482 (top), NWA 998 (right), NWA 1195 (bottom). Adam and I let out a jubilant, “Yahoo!”, and did the celebratory “high-five”. Full electron microprobe analysis was later performed and confirmed the results of the thin section. This was our first planetary meteorite and we had reached our goal after only eight months. The new Martian meteorite was given the provisional name NWA 1195. Since we insisted on detailed notes as to where each stone originated (and by which nomadic group), a search was initiated in the Safsaf region where the 50-gram stone was found. Within a week, another 265-gram stone was located 15 meters from the first site. Using Yousef to translate, Akmed insisted it would “glue” to the 50-gram stone, “like it had broke from it”. He sent a photo by email that looked very promising. We sent payment for the stone so he could pay the nomad who found it and within four days it was in Akmed’s possession. We asked him to send us the 265-gram stone but he refused, saying he knew it was too valuable to send in the mail. I tried to encourage him to send it but all I heard were horror stories of lost packages. Akmed insisted we would have to fly to Morocco to retrieve the stone. I felt we would not receive this Martian meteorite unless we went. It was decided I would go to Morocco to retrieve the second piece of the new Martian stone because I had been there before, and without hesitation, I enthusiastically agreed to embark on the trip. Before leaving, Adam and I decided I should take the cut end from the 50-gram stone that appeared it would fit to the larger 265-gram half. This way I could see if the two halves would truly “glue” together as promised by Akmed. We also felt it would be best to have a code phrase I could call Adam with once I saw that the end cut would fit with the other stone. This way I would not appear too eager to take possession of the prize in front of Akmed. We did not want the possibility of losing this Martian meteorite to a partner’s potential greed as had happened in a previous arrangement. Details all set, we were ready. Starting in Seattle, the trip would take a grueling 36 hours and four different sleepless stops just to reach my final destination in Ouarzazate, Morocco. While in Casablanca, I endured an eight-hour layover at the airport with no sleep. I did not want to risk taking a nap at the airport as I was carrying a large amount of cash, not to mention my carry-on luggage that contained all of the tools I would need while in Morocco. We had heard stories of other people being mugged while in their travels. After drinking about $100.00 worth of Moroccan coffee to stay awake, not only was I in a foreign land, I felt like I was flying in outer space! The next and final leg of the journey was a quick 45-minute hop to Ouarzazate. Upon arriving, the local time was 12 o’clock midnight. Akmed and Yousef were waiting at the gate, both of who were grinning ear to ear. This was the first time I had met either man in person, and they each gave me a “bear hug” and kissed both sides of my face, twice. This is a Moroccan tradition shared with good friends. We left the terminal and headed to the four-wheel drive Land Rover parked outside. Akmed asked me if I wanted to check into a hotel to get some rest after my long trip, but I said we should head straight for Zagora to save time the next day. Akmed, taking this as a sign to do business, drove me to a house no more than 10 minutes from the airport. I was led into a dimly lit room where I was greeted by four rough looking Moroccans sitting on the floor around a large round table. Several large boxes filled with meteorites where haphazardly stacked against a far wall. The furniture was about half as tall as I was used to. It is customary for Moroccans to sit on the ground covered with large rugs and lean against pillows. Even though it was late, one of the men brought out a large brass tray carrying a teapot, several small glasses and a bunch of mint leaves. He also had a butane burner and a toolbox with a huge brick of solid sugar in it. As the water was being brought to a boil, he used a wrench to break off manageable pieces of the sugar. Once the water came to a steady boil, he added a large handful of mint leaves and many large chunks of sugar. While the tea was brewing, another man brought out a bowl overflowing with almonds and roasted bread snacks. The man making the tea began to pour the brew out of the pot in a high arching motion into one of the glasses. After repeating this process several times, he sampled it and determined that it was ready to drink. He poured the first glass and offered it to me since I was their honored guest. After two hours of searching the boxes filled with stones, I set aside several kilos of meteorites to purchase on my return from the desert. With Yousef’s assistance, I negotiated with one man named Mohamed, while the others sat back on their pillows watching the spectacle. We made arrangements to meet him in four days so we could settle the account. Akmed, Yousef and I left into the middle of the night, heading for Zagora through the Atlas Mountains. Three hours later, about 5:00am, we arrived at our destination, Akmed’s house. It was a simple one-story mud brick structure with no running water. Without having to ask, Akmed presented the brown and black 265-gram stone to me. Trying not to look excited, I held the stone and thought that it looked just like the 50-gram Shergottite. I pulled out the end cut from the 50-gram stone and placed it to the larger counterpart. I thought, “They fit perfectly… just like a puzzle piece clicking into place!” I could barely hold my emotions but knew I must because I did not want to risk losing the stone. I used Akmed’s cellular phone to call Adam and said I had made the journey safely and then repeated our code phrase we had agreed upon two days earlier, “The eagle has landed!” This meant that I had the 265-gram stone in my possession and that it was a perfect match. Adam, in Seattle, let out a loud cheer, while I kept a straight face in front of Akmed and Yousef. I then hung up and was ready for some sleep. suitcase. We then sat down to an interesting breakfast, which consisted of a very thick and chunky “orange juice” along with various fruits. We were ready to head for the desert to meet different nomads on a three-day trip that would take us far away from the small towns and villages that lined the Moroccan-Algerian border. Akmed insisted that I should wear clothing similar to the local nomads since we would be entering into the militarily patrolled “disputed zone” between Morocco and Algeria. He felt I would be “safer”. This robe-type outfit is called a “jallaba”. This was topped off with a “shesh”, a scarf-type length of cloth that wrapped around my head. a Martian meteorite to land as the area looked just like the surface of the red planet. 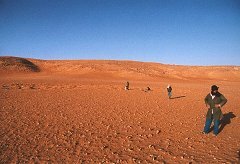 Berbers looking for pieces of Mars. 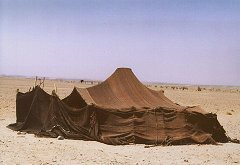 Traditional Berber tent in the Sahara. of a nomad family he knew. It was a more permanent residence than the typical Berber tents many nomads live in. This family had a mud brick dwelling complete with a small garden. We enjoyed their hospitality and would stay the night. A meal of mint tea and “couscous” was served. It was a good dish made of goat meat, vegetables and rice. We ate this with pieces of bread, using our fingers. The rest of the night was spent talking about a variety of worldly topics and telling 'desert riddles' to pass the time. 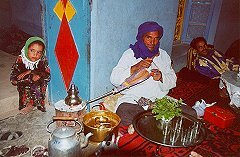 Making mint tea in Safsaf. Colorful ‘Dab’ lizard from the Sahara. was quickly clubbed in the hand by the aggressive brute. To Akmed’s amusement, Yousef ran off screaming in pain with blood trailing from his hand. Yousef returned holding his injured appendage and said, at a respectful distance from the reptile, “The ‘leeezard’ has good defense against me”. Akmed informed us that the Dab was a meat eater and that if it bit a finger, he would have to cut it off because the lizard has very sharp teeth and would not let go. Lunch break in Berber tent. makeshift bandage made from an old tee shirt, we made our way deeper into the desert. Yousef kept his feet off the floor the rest of the day. He said he didn’t want to get attacked by the vicious beast lurking below him. We traveled many hours and eventually found ourselves at the final stop of the day, a Berber group’s black colored tent. This was open-sky living at its best. 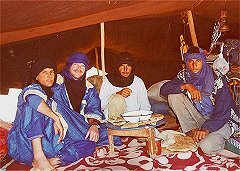 We sat down to a late night meal, which consisted of mint tea and “tagine”; a dish made with meat, vegetables and dates. Our hosts made sure I received the largest portions of meat because I was their distinguished guest. Again we ate with our hands. In the morning we looked at another cache of “meteorites”, most of which turned out to be terrestrial rocks. Business accomplished, we were set for another eventful day in the desert. Before entering the truck, Yousef said nervously, “Where is the ‘leeezard’ hiding”? He didn’t want a repeat of the previous day’s assault. He located his archenemy hiding in the shadows of the truck’s floorboards and positioned himself clear of our reptilian travel companion. We drove over more of the same barren terrain. It was a flat nothingness as far as the eye could see in all directions. After hours of this travel on a “road” that consisted of only a faint pair of tire tracks, the area gave way to a small gorge that had an oasis in it. This is where the small village of Safsaf is located. The inhabitants had lush green gardens fed by a water source that had been discovered many centuries before. It was truly amazing that they could survive out in the middle of the desert in such a way. Akmed took us to the mud brick home of the man who found both halves of NWA 1195 but was told he was in Algeria and would not be back for several days. It was agreed we would stay the night there and then departed to meet with other villagers to see what material they had. 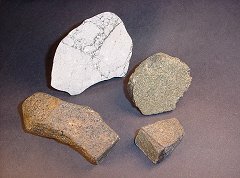 We acquired a few more excellent meteorites but most of the material turned out to be very deceiving terrestrial rocks. When we returned back to the earthen residence, we found that our hosts had butchered a goat in our honor and would prepare goat-liver kabobs. These were made with cubes of goat liver wrapped in stomach lining then put on a skewer and cooked over an open flame. This was followed with mint tea and fruit. After Akmed’s nightly prayer and having had a good night’s sleep, Yousef checked the location of the “leeezard” in the Land Rover. We left early and headed for civilization, back to Ouarzazate so I would be able to catch my 5:30 am flight the next morning. It took all day and half the night to reach the outskirts of Ouarzazate. To Yousef’s relief, this is where we decided to free our mascot. Akmed released the orange lizard and we watched it disappear into the darkness of the night. Once in town, we checked into a hotel and made arrangements to meet Mohamed, the man we met the first night. He arrived 45 minutes later with several hundred pounds of meteorites and two helpers to assist him with his burden. It took three hours to haggle over the bounty but several more nice stones were acquired. We shook hands once a price was agreed upon and settled our business. After Mohamed and his two companions left, I carefully packaged the material, mindful to leave the prized Shergottite out so I could hand carry it during my travels back to the United States. I was not about to let it leave my possession after what I had gone through to acquire it! As there was not enough time for sleep, I quickly freshened up and was then whisked away to the airport where I boarded my plane for Paris by way of Casablanca. I would have to wait until the next morning for my flight to the States. This allowed me time to catch up on some well-deserved sleep. The next day’s flights were on time and uneventful. Once in Seattle, the 265-gram half of NWA 1195 was reunited with its 50-gram counterpart after having weathered separately for thousands of years in the Sahara Desert. Everybody involved was overjoyed by the success of the expedition. Not only did Adam and I achieve a dream of finding a planetary piece we also brought together a whole Martian meteorite. We made a mold of both halves, forever capturing the shape of this fantastic meteorite. Generous portions of both NWA 998 and NWA 1195 have been donated to the scientific community for future study. A small amount of each meteorite will be made available to private collectors. Not only will this allow private collectors access to these wonderful new meteorites, it will help to offset the enormous costs involved in obtaining these rare specimens. Adam and I set a goal to find a planetary meteorite and far surpassed it. It was a meteorite hunter’s dream come true.